Socialists see the international communist movement far differently than most mainstream Westerners do. This is not because they are deluded. It is because they have inside knowledge and a far greater understanding of Marxist-Leninist strategy than we do. Worldwide, Marxist-Leninist parties are growing again and most believe that China and Russia will eventually return to a more openly socialist stance. They believe that allied with the likes of Castro, Chavez, Mbeki, other third world revolutionaries and much of the Islamic world, they will be able to challenge and defeat the West. Below is a recent article from "Vanguard" newspaper of the pro-Chinese, Communist Party of Australia (Marxist-Leninist). “Thanks to China and Venezuela, we are in good way to resolve the crisis that appeared in our country after the collapse of the Soviet Union in 1991." Cuban leader Fidel Castro said these words last year. 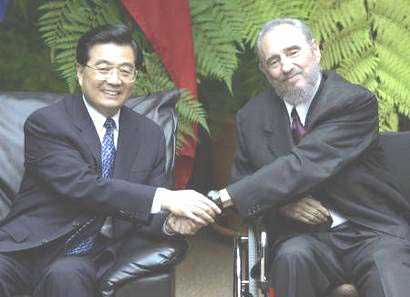 In November of the previous year, Hu Jintao the Chinese President, made a goodwill tour of South America. It included Cuba. There is no doubt that relations between the two countries are strong and getting stronger. The positive standing of China extends through Latin America. "We have a solid base on which to deepen our relations, thanks to our many shared common politics. We both choose a socialist path to our development," Hu said when the two leaders met. “Socialism will remain in the end the only real hope for peace and the survival of our species," added Castro and noted Cuba and China share "the ideals of socialism;” that China "objectively speaking has become the most promising hope and the best example for all developing countries." "I do not hesitate to say that it is now the main engine of world economic growth … Each people must adapt its revolutionary strategy and goals to the specific conditions of its own country. "In a country that was overwhelmingly rural, a vanguard of workers and intellectuals contributed to the poor and oppressed of China the enlightening ideas of socialism, inspired by the genius of (Karl) Marx, and the boundless daring and revolutionary talent of Lenin,"
Cuba’s Vice President, Raul Castro, said at a business forum during the same visit, "China has achieved nothing short of a feat, transforming a poor, backward and multiethnic country into a genuine power," and that "this was not a miracle; rather it was achieved through the guidance of the Communist Party, which led toward socialism using Chinese techniques for this growth." Raul Castro continued, “In Cuba, we, too, adopt socialism to buttress our independence and economic development." Referring to Hu's tour, Venezuelan President Hugo Chavez stated: "China came to Latin America like a sister. China reached out a hand in friendship toward those who needed it most." At a conference around that time Castro Neves, Brazil's ambassador to China, declared that: "In 2003, our economy had zero growth. We did not progress, but, fortunately, did not regress either. Without China, we would have regressed almost 1 percent." In Brazil, the largest country of South America, where 185 million inhabitants live, this 1 percent represents the difference between suffering from famine and having enough to eat for hundreds of thousands of people. China is now Cuba’s third largest trading partner, behind only Venezuela and Spain. In varying degrees, China supports Cuban education, oil exploration, nickel mining, technological development and transportation infrastructure. 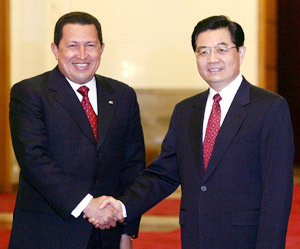 At the end of 2005 a group of leaders of the Communist Party of China arrived in Cuba for talks with their Cuban counterparts. On December 21 the Cuban President received the Chinese Communist Party’s Political Bureau Standing Committee member Luo Gan at the Revolution Palace in Havana. Fidel Castro and Luo Gan examined the state of bilateral relations in the presence of high-ranking Communist Party officials from both nations, according to the Granma newspaper. NoteThe West generally thinks China is on the way to "liberal democracy" because she has enjoyed great success through using capitalist methods. Unfortunately most fail to realise that Marxist-Leninists have always acknowledged the huge productive power of capitalism and have often used it when it suits them. Lenin's New Economic Policy of the '20s was widely seen as a capitalist restoration in Russia-until Stalin reversed it. Marxist-Leninists have learned by their mistakes. They no longer nationalise industry when coming to power, they milk capitalism, while tightening their grip on all other sectors of society. South Africa under Mbeki, Venezuela under Chavez or Brazil under "Lula" are good examples of the modern approach to socialist take over. Russia Backs Iran. Who is Surprised? What Does Kotare School Actually Do?